How do Islamic fundamentalists indoctrinate their flock into sponsoring extremism or jihad? They do so by portraying their non-Muslim opponents as cruel and heartless toward Muslims and always portray Muslims as peaceful and law-abiding victims. This creates a tremendous sense of grievance among the Muslim masses, which is exploited to start a jihad – and make their opponents feel guilty and unable respond decisively to this jihad. I discussed this in a previous publication of mine at a greater detail (When are India and Pakistan ready for peace?). 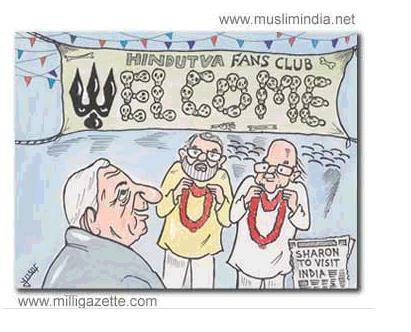 Following is a set of cartoons taken from a prominent Indian Muslim magazine called "Milligazette". 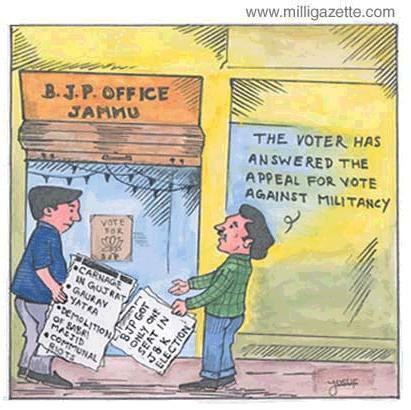 These cartoons are available at http://www.milligazette.com/cartoons (let me acknowledge "red flag" who first posted some of these at Sulekha.com). This English magazine is read by the educated among the Muslim community. This tells us all the extent of extremism that has griped Indian Muslims, -- even the educated ones! For an in depth analysis of Islamic fundamentalism and how to deal with it I refer the reader to a publication of mine (Islam’s Weakness). Below is my commentary, followed by the cartoons. This is my favorite! This describes peaceful Muslims and their religion threatened by a violent Christian America, Jewish Israel and of course, Hindu India. It makes it clear that Islamic ideology doesn’t want peace to be disturbed, but doesn’t bother with the fact that most terrorists originate from Islam, who quote the Koran to justify violence! It says: "All humans are equal". But in almost every country where Muslims are a majority, most non-Muslims have either been driven out or treated as second class citizens constitutionally, -- including in South Asia. 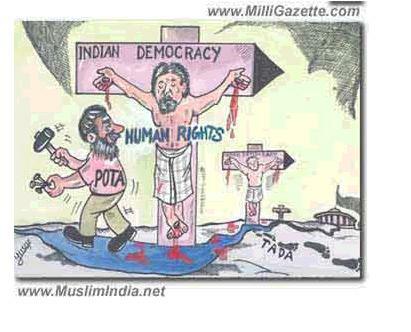 This cartoon promotes the view that Indian Muslims are being killed or tortured by the Hindu majority, assuming that the grooming and the dress of the person in the cross reflects that of an Indian Muslim (who else can be a victim!). It conveniently neglects the fact that Islamic terrorism in India is sponsored and conducted predominantly by the Indian Muslim community. When Hindus are killed by Muslim terrorists, there is always a reason and possibly a justification! 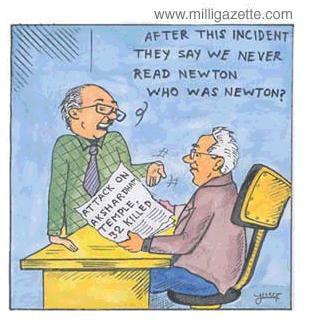 This cartoon uses the Newton’s law of action and reaction. The "nuclear physicist" and the "father" of Pakistani nuclear program propagated the nuclear bomb know-how for yet another reason -- so that Muslim "victims" could nuke " infidels". How easily even educated Muslims can get brainwashed, through a system of lies, deception and false propaganda! Is India entitled to defend itself from a terrorizing Islamic Pakistan by getting help from Jewish Israel? This cartoon feels otherwise, by focusing on the negative. Finally, what is the hot topic to talk about Kashmir? According to this Indian Muslim daily, it is Gujarat carnage and issues where Muslim victimhood is emphasized, but not the issue of Islamic militancy in Kashmir valley and certainly not the fact that most Hindus have been driven out of this Muslim majority region. These are of course inconvenient facts. 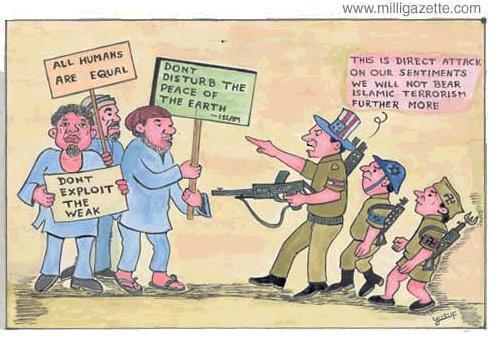 After all, Muslims are a peaceful lot, -- going by the first cartoon!